Biryani is the king of all rice recipes and this Vegetable Biryani has mixed vegetables and basmati rice, all cooked down in a medley of spices! Seriously, the best thing ever! Biryani is one of those things that most of us go to, for special occasions. Nothing makes something special than the love and time and all kinds of good things poured into this delicacy that all of India and the rest of the world loves. While the sound of the elaborate process might be a little intimidating, it is actually pretty simple. The secret is to not skimp on your spices and the flavors. We need a very condensed flavor packed vegetable curry base that when layered with the fragrant basmati rice will become the most exquisite dish. Every state, every region in India has its own version of a biryani and this one is a Kerala Style Biryani. The masala base is what I use for making my Kerala Style Chicken Fry and the Kerala Chicken Biryani. The biryani is topped with fried bread cubes / croutons, crispy fried red onions and fried cashew nuts and raisins. The fried bread cubes is something I have mostly seen in Southern Kerala – Trivandrum, so I think I can call it a Trivandrum Style Biryani as well. 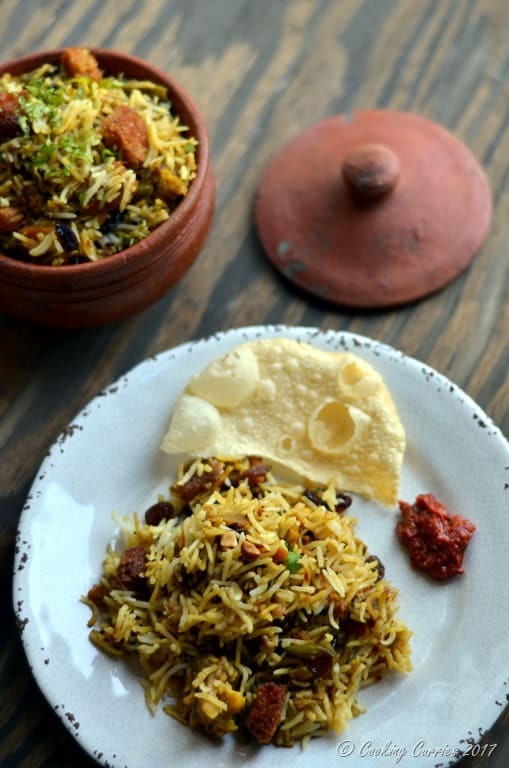 Even though every region in India has its own version of a biryani, the difference is in the nuances, a certain type of spice included or omitted, layered or not layered, made dum style or not but the basic idea of rice with a medley of spices and either vegetables or meat is what makes a biryani. 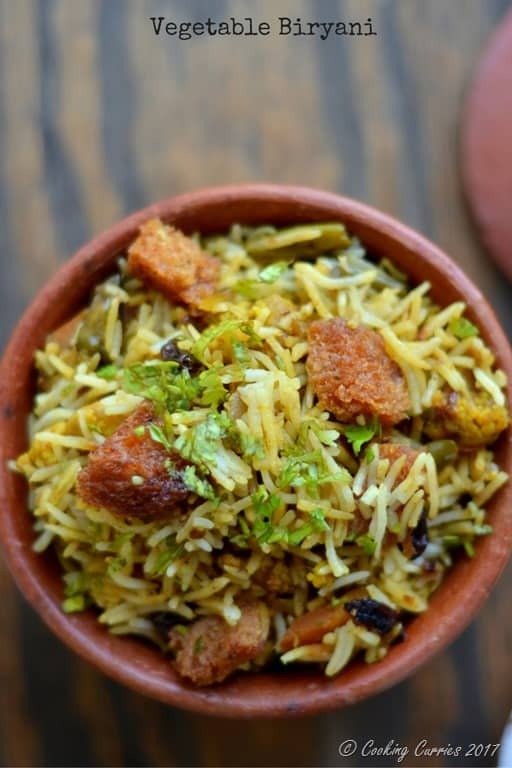 Here are some other biryani recipes that you would love! Rice: Wash the rice and fry it in the ghee for a couple of minutes. Add the water and salt and let it cook till you can no longer see the water and small bubble-holes form on top of the rice. Switch off heat and cover and keep. Grind the ingredients under “grind to a paste” and keep aside. Heat the ghee in a wide heavy bottomed pan. Add the onion, whole spices, turmeric powder and cayenne and sauté till the onions are soft and light brown. Add the tomatoes at this point and cook till they soften. Add the ground paste and salt and cook for a few more minutes. Now add the vegetables and a little water and cover and cook till the vegetables are soft. Remove the vegetable masala mix to a different bowl. Layer the pan in which you cooked the vegetables in, alternatively with the cooked basmati rice and the vegetable masala mix, starting and ending with the rice. Keep it covered and cook over low heat for 10 mins or so. Heat the oil for deep frying. Toss the onion slices with the flour and add to the hot oil. Fry till onions are crispy and brown. Drain and keep aside. Fry the bread cubes till they are brown and crispy too. Drain on paper towels. Heat the ghee and fry the cashew till it is golden brown and the raisins, till they puff up. 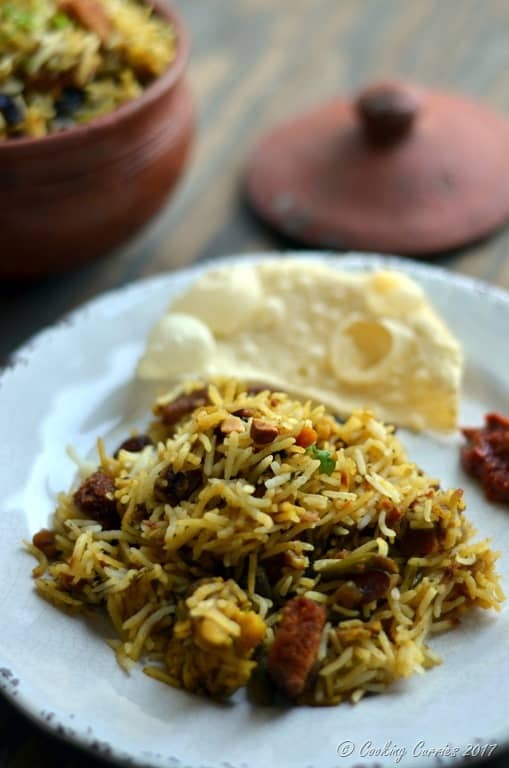 Switch off the heat of the biryani pot and garnish with the fried onions, bread cubes, cashews and raisins. Top with finely chopped cilantro. 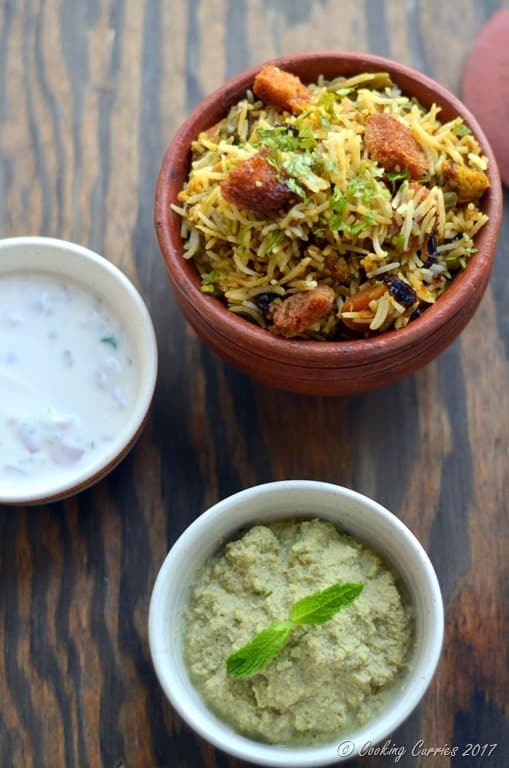 Serve hot with a raita of your choice, biryani chammanti / chutney and some Indian pickles. Remove the vegetable masala mix to a different bowl. Layer the pan in which you cooked the vegetables in, alternatingly with the cooked basmati rice and the vegetable masala mix, starting and ending with the rice. Keep it covered and cook over low heat for 10 mins or so.